Know how to prevent, treat and control the black spots on roses easily using the given home remedy. 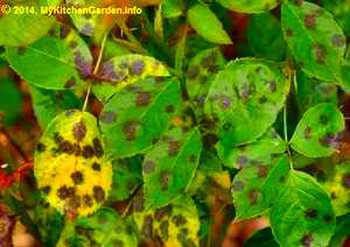 The black spots on rose leaves is a common and damaging fungal disease. The black spot disease usually occur during wet summers on roses. This fungal infection becomes a problem if the leaves are wet for several hours. If the black spot disease is not treated, it can cause complete defoliation of rose bushes. You can use the homemade remedy to get rid of black spots on roses. Try the homemade sprays given below to treat black spot on roses naturally. However you can prevent, control and treat the black spots on roses naturally as given below. I propagated several roses by cuttings (rose propagation). They grew well but it was a great disappointment for me to notice many black spots and yellow leaves on them, the leaves felling down. Circular black spots of size 4 mm to 1 cm in diameter appear on the upper side of the leaves. Infected leaves turn yellow and fall prematurely. If not treated, the disease spread quite quickly and the leaves are infected, covered with spots, turn yellow and fall. Buy a disease resistant rose plant from the nursery. Position the rose plant where they can get 6-8 hours of sunlight daily. keep enough distance between your rose plants to allow good air circulation. Prune out some centre branches and inward branches to allow internal air circulation. Keep the plant clean of diseased leaves fallen on the soil. Prune off all the diseased canes, cut a few inches into good wood. As excess moisture encourages black spot, do not wet the leaves and branches, just deep soak at the base. Water in the morning so that the leaves can dry out. Do not over-water your rose plants. During hot and dry weather, water 2-3 times a week, while in cooler days, water weekly. Remove infected leaves and branches and fallen leaves as soon as black spot appear to slow down further progression of the fungus. Don't wait for the black spot to appear. Spray a fungicide on roses every 1 to 2 weeks with a fungicide during growing months. There are several fungicides including chlorothalonil, mancozeb, Thiophanate-methyl, trifloxystrobin, Ziram, etc. Add sulphate of potash in spring, summer and autumn to the soil to avoid deficiency of potassium which makes roses likely to have black spot disease. A spray of neem oil is a preventive spray which also helps control many rose pests. Other fungicides that may be applied periodically are copper spray, lime sulphur, potassium bicarbonate, sulphur and hydrogen peroxide. I control black spots on my roses with my home remedy, i.e. a baking soda spray. Mix a 2 teaspoon of baking soda with a litre of water. Add 2-3 drops of dish washing soap. Spray both side of the leaves. Reapply weekly and after any rain. Baking soda makes it more difficult for black spot to infect plants. Do not wait for the spots to appear. Spray baking soda periodically on your roses. Mix 10 ml milk in 100 ml water and spray directly on both sides of the leaves of roses. The fat in the milk coats the leaves, resulting in the growth of a fungus that prevents the black spots.